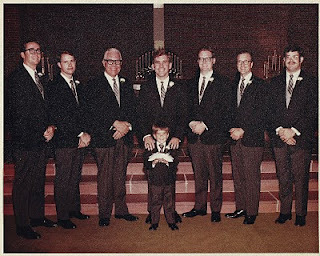 The next photo shows Don second from the right, between Al and Ken. The final photo doesn't have Don in it, but it's one of my two favorites from the wedding, so I thought I would post it. 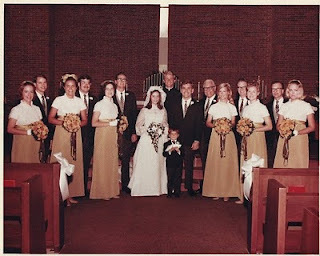 The first wedding in my memory was that of Don and Ann in 1952 at the First Baptist Church of East Point, Georgia, the middle class suburb of Atlanta where my grandfather had his funeral home and, right next door to the funeral home, his own home. It was a grand wedding, and I remember the excitement and joy even today. I was six years old then. There is a photo among the pictures in Ann and Don's wedding album which has me in it, looking up at Ann in her beautiful wedding dress. I had about the same expression on my face as the one in the third photo. 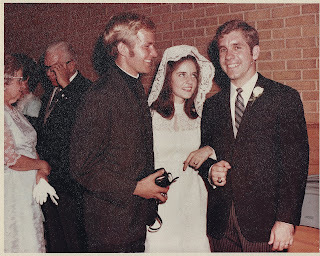 Both Ann and Carol were stunning brides, and both Don and I very blessed young men. I have completely lost touch with him. He became a dentist and moved to a town in New England to practice, is the last I knew.